The black and white cat has been around for ever. 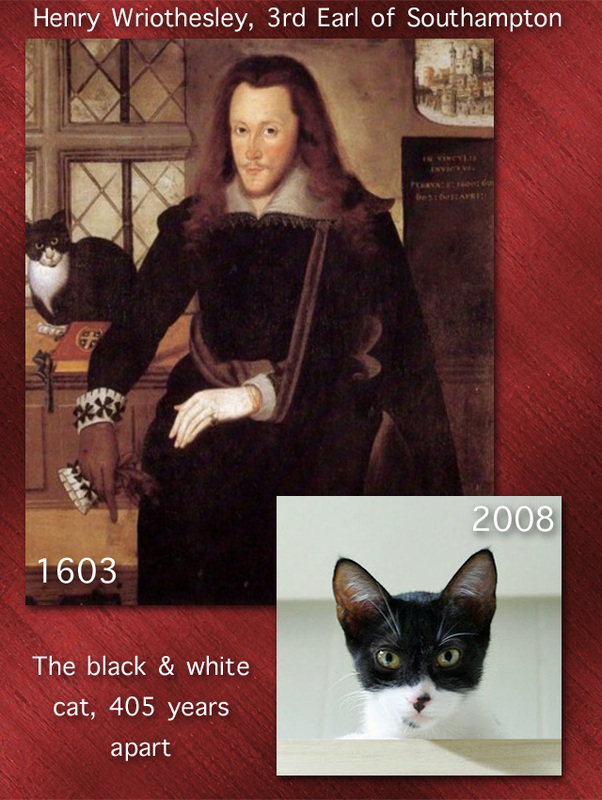 These pictures show us almost identical looking cats from 1603 and 2008. A time span of 405 years. That is about the entire time the domestic cat has been in North America by some accounts. Black and white cats 405 years apart. The 2008 cat lives in Brazil and the photo is by Giane Portal. The painting was done at Boughton House, Northamptonshire, England. The map places it. The domestic cat was first introduced into England in about 200 AD. I’d expect the black and white cat (bicolor) to have been in England for at least 1000 years and more by the time Henry Wriothesley, 3rd Earl of Southampton adopted a black and white cat as a companion. The black and white cat in the photograph lives in Brazil. We don’t know when the first domestic cats arrived in Brazil. Probably in 1492 when Christopher Columbus discovered the continent. If not then, not long afterward, I would expect. Henry Wriothesley, 3rd Earl of Southampton is perhaps best known for being the subject matter of some of Shakespeare’s sonnets (a type of poem). He was a patron of Shakespeare too. He lived from 6th October 1573 to 10th November 1624 (51 years). The black and white cat (“solid and white“) is a domestic cat evolution. The coat is a product of domesticity because the original domestic cats were tabbies. It seems that the domestic cat no longer needed to be camouflaged and so developed striking coat types. The normal process of natural selection of the domestic cat as a process to aid survival was turned on its head because the cat was looked after by people. This process took place in and around the Mediterranean and to the east (“the fertile crescent”). The white areas are formed by hairs without pigment caused by the presence of the piebald gene, the same gene that produces the American “painted horse” and the piebald horse. The Earl went to Cambridge University at aged 12! He graduated with a masters degree in 1589. He was 15 years of age. Extraordinary. Clearly his intelligence informed him what great companions cats are. People who are in the know, realise that intelligent people keep cats. He died from a fever while fighting the Spanish in the coastal areas of Belgium, the Netherlands and Luxembourg. I would love to know what he called his cat. Cat names in those days must have been different to cat names today. I’d expect it to be something like “Socrates”. I am presuming that the cat in the painting belonged to him. That might not be the case. He would certainly have wanted the cat in the painting which strongly indicates companionship. This entry was posted in Cat Anatomy, Cat Art, Cat Coats, Cat History, Cat photography, Cats in Art, Cats in art, photography, Moggie and tagged bicolor cats, black and white cats, cat history, cat history pictures, cat photography, moggies, pictures of cats by Michael Broad. Bookmark the permalink. The Earl and his cat have the same expression on their faces and he is wearing a light coloured collar leaving a V which matches the cat’s white bib. What’s more, his hand without a glove is painted white. It’s almost as if the artist has painted the close relationship of the two! Yes, the Earl being so clever so young shows that true cat lovers really are the most intelligent people. Yes, I think the domestic cat was probably better off then. As you say no damn cars for a start, just carts and horses – no real danger there. And “Socrates” may well have been chosen by the Earl because of his beautiful coat. Food? Probably left overs from the meat platter! Veterinary treatment: none. If he was a healthy cat his life would have been pretty good and long. I have a very strong feeling that this distinguished Earl really liked the domestic cat. He may have had more than one cat and he chose the black and white with the Zorro mask for the painting. Love this! I have ancestors from Northamptonshire! You look a bit like this gentleman. Any relation? Wouldn’t it be funny if I could trace some aristocracy in my past. Unlikely however.